New Zealand: An outbreak of mumps. Public health officials in New Zealand have reported an outbreak of mumps. 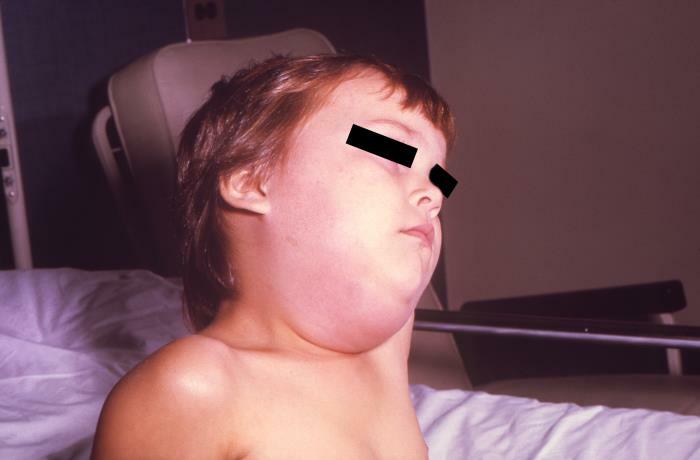 Mumps is a contagious disease that is spread when infected people cough, sneeze, or talk. Sharing items, like cups or drink cans, with infected people can also spread the virus. The virus can also live for several hours on items and surfaces touched by an infected person. Symptoms of mumps include fever, headache, muscle aches, tiredness, loss of appetite, and swollen and tender salivary glands (under the ears or jaw) on one or both sides of the face. Some people who get mumps have very mild or no symptoms, and often they do not know they have the disease. CDC recommends that travelers to New Zealand protect themselves by making sure they are vaccinated against mumps. The only mumps vaccines available in the United States are the measles-mumps-rubella (MMR) and the measles-mumps-rubella-varicella (MMRV) vaccines. Children should get two doses of MMR vaccine, starting with the first dose at 12 through 15 months of age, and the second dose at 4 through 6 years of age. Teens and adults also should be up to date on their MMR vaccinations (two doses at least 28 days apart). Before you travel, make sure you have already been vaccinated. If you are not, get the MMR vaccine. While traveling, wash your hands often. If soap and water aren’t available, use hand sanitizer (containing at least 60% alcohol) to clean hands. Learn more about preventing mumps and what to do if you think you have it on the mumps page for travelers. The Texas Department of State Health Services is advising health care providers to be on alert for mumps in their patients as the state experiences a 20-year high in mumps cases. State, regional and local health departments are currently investigating multiple outbreaks throughout the state, including one involving possible exposures on South Padre Island, a popular spring break destination for students from Texas and elsewhere in the United States. Texas has had 221 mumps cases this year, the largest total since there were 234 cases in 1994. Mumps cases potentially linked to South Padre Island first came to light this week when another state health department contacted DSHS about a patient with mumps who had traveled to the area for spring break. DSHS alerted other states and has been notified of 13 mumps cases in people who traveled to South Padre Island between March 8 and March 22 from six states, including two cases from Texas. Mumps symptoms include swollen or tender salivary glands, swollen or tender testicles, low fever, tiredness and muscle aches. People usually develop symptoms 16-18 days after being exposed to the virus, but it can be as long as 25 days. People who think they have mumps should contact their health care provider, and anyone suspected of having mumps should stay home while they’re contagious – five days after swollen glands occur. Health care providers should consider mumps in patients with compatible symptoms and ask them about travel out of state, to South Padre Island from March 8 to 22 or about any possible exposure to someone with mumps. DSHS also reminds providers they must report suspected mumps cases to their local health department within one work day. Additional information for providers is in the health advisory at http://www.dshs.texas.gov/news/releases/2017/HealthAdvisory-04122017.aspx. Mumps is highly contagious and is spread through coughing and sneezing and sharing cups and utensils. The mumps vaccine is the best way to keep from getting mumps, and research shows the mumps vaccine protects 88 percent of people who are fully vaccinated. However, some vaccinated people still get sick if they’re exposed to the virus, so it’s also important for people to help stop the spread of mumps by covering coughs and sneezes, washing their hands frequently with soap and water, and not sharing food and drinks. If you don’t know your vaccination status, talk to your health care provider about getting vaccinated. As of March 22, 2015, Health Protection Scotland has reported 242 confirmed mumps cases in 2015. This is an increase from the 45 cases reported during the same period in 2014. The outbreak of mumps is linked to cases in educational establishments and the community. CDC recommends that travelers to Scotland(http://wwwnc.cdc.gov/travel/destinations/traveler/none/united-kingdom) protect themselves by making sure they are vaccinated against mumps before travel.